Tired of the dull, lifeless colors of other natural eyeshadows? Zuzu has the most sophisticated range of colors we have ever seen. From deep matte hues to shimmering funky colors, we know you'll find the perfect cruelty-free color! Available in the following tones (All colors are shimmers unless indicated. 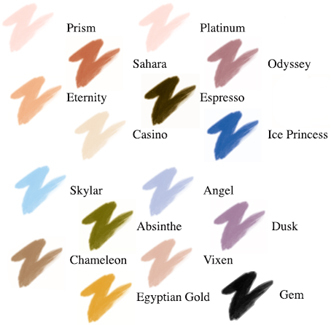 Matte tones will be followed by an asterisk): Prism , Eternity, Sahara*, Casino, Platinum, Espresso*, Odyssey, Skylar, Ice Princess*, Chameleon*, Egyptian Gold, Absinthe*, Angel*, Vixen, Dusk and Gem (see detailed descriptions of colors below). .053 oz compact is $12.99. From Eden Arbaugh of LOUISVILLE, Kentucky on 9/11/2012 . From Anonymous of CO Springs, Colorado on 2/7/2011 . This eyeshadow is great and doesn't give me skin allergies! No more cosmetic rashes on my eyelids! Very Good, Just don't drop it! From Melissa of Rye, New York on 12/13/2008 . It's very nice, lasts for a long time and has a nice texture. I dropped mine though and it broke up into tiny pieces, but still salvageable! From Anonymous of Flemington, New Jersey on 2/6/2008 . I bought this in Ice Princess and after trying different brands and this stuff is the best. It doesn't wear down by midday like other brands and it has the highest quality. All in all: natural (and especially organic) ingredients always beat chemicals! From Roxy of Vancouver`, British Columbia on 10/3/2006 . I bought the Prism colour, and was quite impressed. It's a very light pinky/silvery colour with a nice shimmer to it. Suitable for day and evening wear. It's also long-wearing.